I ❤ Sprinkles “on” Georgetown! I’d heard of Sprinkles from Stacy, but little did I know on my first visit, that it was started in Beverly Hills and has been stated as “the world’s first cupcake bakery” by the Food Network. The shop in Washington DC is very crisp, clean-lined, and contemporary. The decorations on the cupcakes are the same. Being in DC is always a treat, but since it is also a rarity for me, I decided to buy a half dozen. The staff was very helpful and very cheery! They talked to me about the flavors and made some recommendations. I was lucky, because no one else was there, so they could really take some time with me and help me pick! Here are my flavors and thoughts! Moist fluffy cake that screamed citrus! 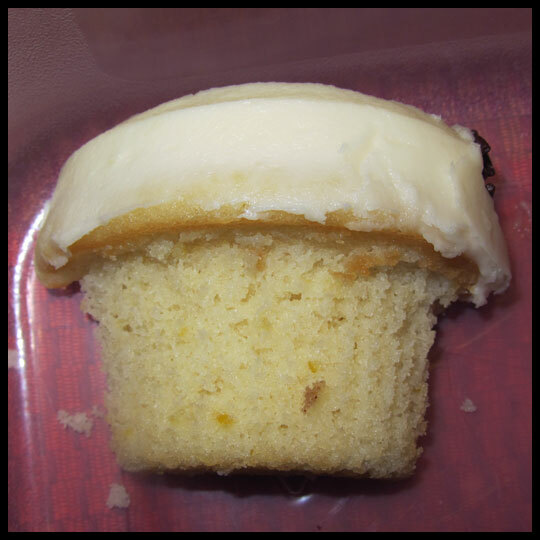 The frosting was very sugary, and missing the vanilla flavor that I was hoping for, but this is a great cupcake for a sweet-tooth looking for a lemon/sugar fix. 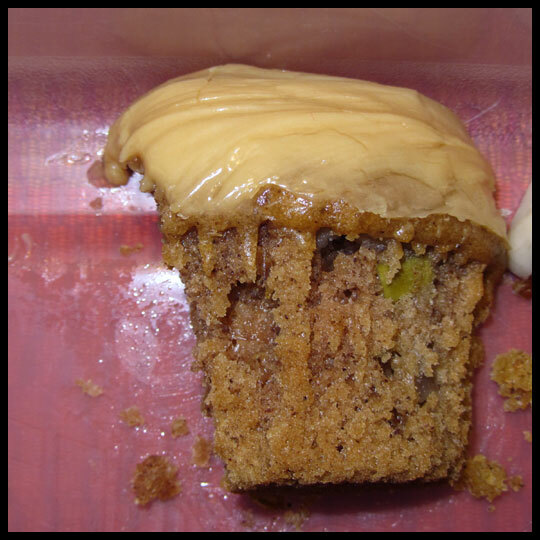 Chocolate Chip peanut butter cake was less moist than most of the other cupcakes, but still worth it! The frosting can only be described as “super yummy” – not too sweet, with just the right amount of savory, a must when you are talking peanuts! The chocolate jimmies on top where reminiscent of my kid days. I’d like to eat one of these for breakfast… and the next time I get down to DC, I plan on saving it for the next morning. While I think $3.50 for a cupcake that doesn’t have frosting is a little steep, this is a very interesting take on one. 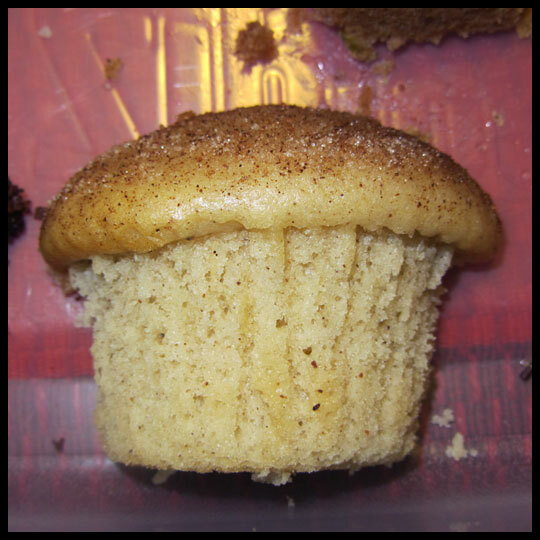 It tastes like a fluffy snickerdoodle cookie, and I could have eaten the cinnamon & sugar covered top over and over again! WOW. 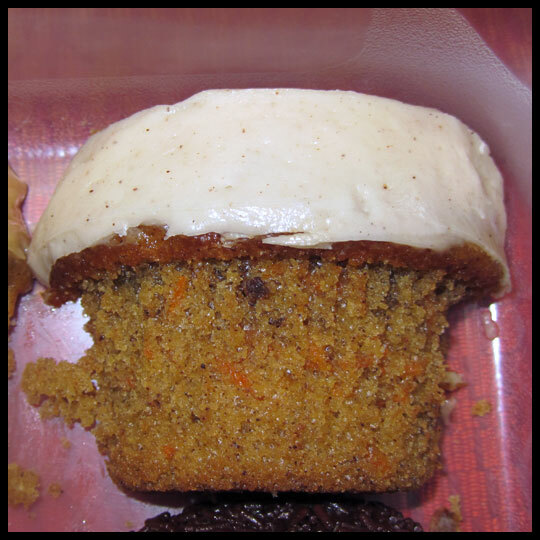 What a carrot cupcake! Moist, cinnamon-y/nutmeg-y cake with REAL carrot pieces in the cake. The cream cheese frosting was more sugary than I typically like, but all in all this one of the best carrot cake cupcakes I have ever had the pleasure of eating. The apple cake with spices was really nice, the mix of savory in the cake works so well with the very sweet lightly caramelized flavor of the frosting. The frosting left me wanting more caramel flavor and less sugar, especially because this it is also a cream cheese based. Well, as you all know, I am some-what of a red velvet maniac. This one did NOT disappoint! It is by-far the second best red velvet I have ever tasted. The cake was just as the others, super moist. The frosting was sweeter than the usual cream cheese frostings (just as on the other cupcakes) but on this one it worked. The cake’s subtle sweetness equaled out the over-sweet frosting and created perfect bliss. 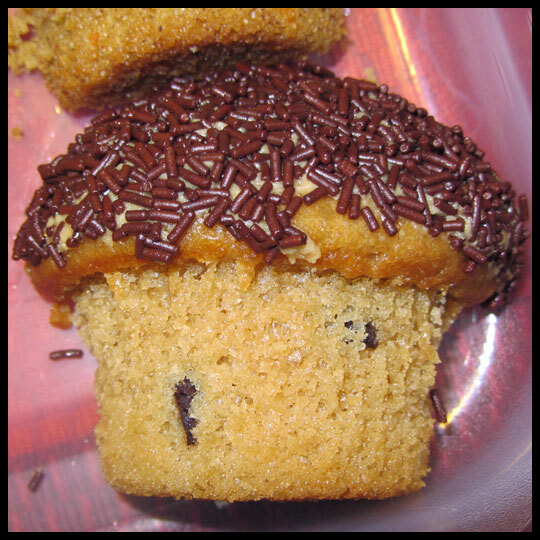 This entry was posted in Cupcake Wars, Cupcakes, DC and tagged Cupcake, Cupcake Wars, DC, Sprinkles by Crusader Elisa. Bookmark the permalink. My family and I also tried sprinkles cupcakes as well as georgetown cupcakes this week and we were actually quite disappointed :(. Sprinkles was our least favorite and didn’t taste like they were baked from scratch. Georgetown cupcakes were better but still not amazing… We still love icedgems in Reisterstown much much more! !